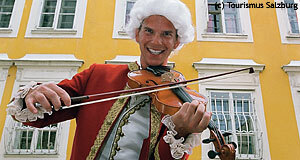 The Hagenauerplatz is a small square in the Getreidegasse Lane in Salzburg′s Old Town. It is almost always crowded, because the birthplace of Wolfgang Amadeus Mozart is located at this square. It is named after the Hagenauer family, a dynasty of merchants who were the landlords of the Mozart family. On the side opposite Mozart′s birthplace, the Hagenauerplatz is ended by an old gate. The square is the original home of the Neptunbrunnen (Neptune Fountain), the peculiar well that you can now find outside of the Furtwänger-Park (just between the Haus für Mozart or Festival Hall and the Kollegienkirche). The Neptunbrunnen was built in 1599 and was at the Hagenauerplatz until 1641, before it was moved to today′s Hanuschplatz. The area of the Hagenauerplatz is also known for various very nice Medieval and Baroque burgher houses that have inner courtyards. The reasons for this architectural feature are historic: Originally, the area between the Mönchsberg hill, the Sigmund-Haffner-Gasse and the Getreidegasse were property of St. Peter′s Abbey, the so-called Mönchsstadt (Monk′s Town). The area of today′s Universitätsplatz and the Old University was an extensive garden of the Petersfrauen, a nunnery. Only later the monastery of St. Peter granted permission for the extension of the houses to the backside by creating a second row of buildings. This created space in between, which was used for horses and decorated with those arcades you can still see today at Hagenauerplatz and several other points along the Getreidegasse.